The torque converter functions on principles of fluid dynamics that are too technical to discuss in detail without the mathematics and science behind it, but the basic premise is simple: when the engine is spinning slowly, very little torque is transmitted through the fluid and turbine inside the torque converter; when the engine is spinning quickly, almost all of the engine's torque is transmitted to the transmission. 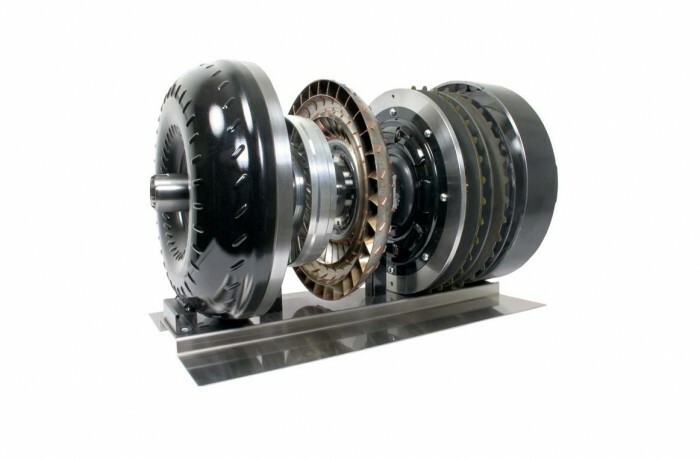 The torque converter is why automatic transmission cars "creep" forward when idling and in "drive", as a small amount of the engine's torque is being supplied to the transmission's input shaft. With the torque converter handling the connection of the transmission's input from the engine, the gears inside the transmission are free to do their work without the driver's direct intervention. But how does the automatic transmission figure out which gear is necessary, and then select that gear? The premise is the same as with the manual transmission, but the way it accomplishes that goal is very different. Instead of gears arrayed along two parallel shafts as in the manual transmission, the automatic transmission uses a single concentric shaft, with sets of gears inside and around each other in a "planetary" arrangement, including a "sun" gear, a "planet carrier" or "carrier" that holds multiple planet gears, and a "ring" gear.